wanderlust ATLANTA: ATLANTApix: The Stormtroopers Are Coming! Talking with a friend at work yesterday about Dragon*Con coming up next week, he told me that he really likes Stormtroopers (photo), so this photo is for him. And it happens to be one of my favorites from last year's Dragon*Con Parade. Underneath the suit and tie, behind the outgoing tourist, even beyond the wanderlust adventures, practically everyone who knows me knows what a huge sci-fi enthusiast I am. And they know how much I'm looking forward to meeting Kate Mulgrew next weekend. 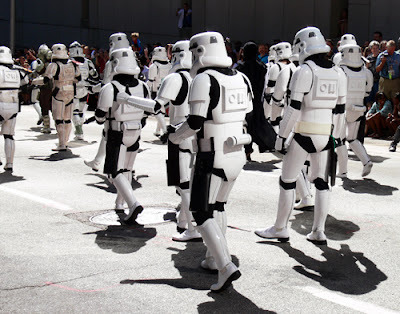 Come to Downtown Atlanta on Saturday, September 3, 2011 at 10:00 a.m. to see the 10th Annual Dragon*Con Parade...and please say "Hello!" when you see me at the corner of Peachtree and Baker Streets. Bravo, if you see us at the parade say hello. We'll be at Peachtree at Ellis maybe then we'll walk through Peachtree Center, maybe the Regency to the Marquis to people watch for a while.